The United States Marine Corps Officer Candidates School (OCS) is a training regiment designed to screen and evaluate potential Marine Corps Officers. Those who successfully complete the period of instruction are commissioned as Second Lieutenants in the United States Marines. Unlike the other United States military services, the majority of Marine Corps officers complete OCS to earn a commission; the exceptions are midshipmen from the United States Naval Academy, limited duty officers, and inter-service transfers. The OCS attrition rate is 30–75% with the female rate being consistently on the high end. It is located at Marine Corps Base Quantico. Depending on the course, Officer Candidates go through either a 10-week (PLC Combined/OCC), or two 6-week courses (PLC) over separate summers, designed primarily to screen and evaluate candidates' fitness to lead Marines by placing them in leadership positions in a stressful environment. The 10-week course only happens after a candidate's junior year of college. Students are evaluated during 2–3 day garrison command billets at the company and platoon level, and squad and fire-team level tactical billets during field exercises. Prior to World War I, Marine officers came primarily from the Naval Academy, or were commissioned from the enlisted ranks. But as the Marine Corps expanded, it needed its own training pipeline for officers. OCS traces its roots to the "School of Application", established in 1891 in Washington, D.C. With the expansion of the Marine Corps for World War I, all instructional efforts were consolidated—first at Marine Corps Station, Philadelphia, then in 1940 at MCB Quantico, where they remain today. OCS is currently located at Brown Field at Marine Corps Base Quantico. PLC Juniors was at Camp Upshur through 1987, but was subsequently consolidated with PLC Seniors at Brown Field. NROTC (Marine Option) in addition to regular NROTC program requirements, NROTC (Marine Option) midshipmen must pass a 6-week OCS course known as "Bulldog" during summer between junior and senior year. "Bulldog" is modeled after the PLC Seniors Course. Officer Candidates must pass a series of tests before being admitted into the Officer Candidate School. An Officer Selection Officer (OSO), usually a Captain, meets with a prospective Officer Candidate. Upon completing a satisfactory interview, the OSO then makes the decision to move the prospective candidate onto the next step. The prospective candidate then must complete a short essay about why they want to be a Marine Officer, provide identification (usually a birth certificate and Social Security card), pass a background check, provide five letters of recommendation, and complete a physical medical exam. After successful completion of these steps, the OSO may then conduct the Officer Candidate through a Physical Fitness Test. Upon reaching a score on the test that the OSO deems to be acceptable (usually in the range of 285 and above), the Officer Candidate then signs the contract (including the contract to attend the course, the fraternization policy acknowledgement, and the Marine Corps drug policy acknowledgement). Candidates choose to enter the program as either a ground, air, or law contract. All of this information is sent to a review board, which will vote to decide if the Candidate should be accepted to Officer Candidate School. These review boards generally convene only once a month. After receiving a majority vote of acceptance from the review board, the Officer Candidate is officially accepted into the Officer Candidate Program and scheduled for a class. OCS screens potential officers using a program designed to test and assess the candidates by using the three graded categories of Academics, Leadership, and Physical Fitness. This includes evaluated events such as the leadership reaction course (LRC) and small unit leader evaluation exercise (SULEE). The Period of Instruction (POI) is divided into must pass events, such as hikes and the Endurance Course, and purely graded events that factor into one of the three graded categories, such as LRC and SULEE. Candidates must maintain a minimum of 80% in Academics, Leadership, and Physical Fitness to graduate, as well as passing all the mandatory pass/fail events such as the Endurance Course. Events that must be passed for graduation are also given percentage grades that factor into one of the three graded categories. 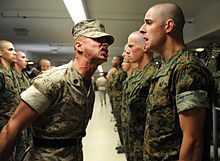 Regardless of course, the instructors usually include officers to handle most academic instruction, enlisted sergeant instructors (Staff Noncommissioned Officers taken from the drill instructor community) to conduct most of the day-to-day management, and other instructors (most often non-commissioned officers) to teach most field skills. Officer Candidates on both courses have many related expenses (including travel to and from Officer Candidate School, meals, and lodging) paid for them (after the conclusion of training), and have expenses for uniforms, books, and other supplies deducted from their pay. The Training and Education Command designs the program of instruction for OCS. The Platoon Leaders Class normally consists of two six-week training sessions taken between consecutive school years, which occur in the summers with no commitment during the school year. Young men and women at any accredited four-year college or university are eligible for this class. Officer Candidates who attend the Platoon Leaders Class may opt for either the PLC Juniors/Seniors program or the PLC Combined program. In the Juniors/Seniors program, a freshman may attend the PLC Juniors course the summer between their freshman and sophomore years, then attend the PLC Seniors course the summer before their senior year begins. Sophomores can attend the PLC Juniors course the summer before their junior year in school and the PLC Seniors course the following summer. PLC Combined is a ten-week program for those interested in completing officer screening during a single summer after completing their junior year in college. Training includes academic and field topics. Academic subjects covered include Marine Corps history, leadership, close order drill, weapons handling, and general military subjects such as land navigation, the Uniform Code of Military Justice, interior guard, moral and ethical leadership, and basic combat. PLC candidates need to be physically fit as the physical training is demanding; for example, Officer Candidates in the PLC Seniors course run and hike an average of 250 miles (400 km) or more during a six-week period. Those who opt for the Juniors/Seniors program will find that the divided program is tailored to provide progressive training. The Juniors course is an introduction into the Marine Corps, and allows the candidates to be evaluated and motivated for a possible commission. Physical training, small unit leadership, and basic infantry tactics are addressed, as well as significant academic instruction. PLC Seniors is an advanced course of indoctrination and contains similar physical training, small unit leadership, infantry tactics, and academics; but at a faster rate and with more instructor-induced stress. Those candidates who opt for the combined course cover the same areas of instruction, but it is integrated without the need to reevaluate candidates due to a year-long gap. NROTC midshipmen attend the PLC Seniors course for their final summer cruise, nicknamed "Bulldog". The main alternative is the Officer Candidates Course, which is designed for college seniors or graduates and enlisted Marines, and consists of one ten-week training session. While the curriculum is identical to the 10-week PLC Combined session, OCC is held three times a year (winter, summer, and fall), and accepts only college graduates. Additionally, graduates of OCC are commissioned immediately upon graduation of OCS. The Quigley is a legendary water obstacle that is currently part of the Combat Course at OCS. Lieutenant Colonel William J. Quigley, a veteran of both the Korean and Vietnam Wars, designed it in 1967. It consists of a long canal with 4-foot (1.2 m) cement culverts submerged in swampy water; candidates must immerse themselves and navigate through the Quigley without standing as a part of the OCS training program. The Quigley, as well as the Combat Course of which it is a part, however, is not a graded exercise and is not necessary for graduation. Officer candidates who complete OCS (and have obtained their college degrees) are then commissioned as Second Lieutenants and sent to The Basic School (TBS) at Quantico for six months of further training with other newly commissioned Marine officers from all other commissioning programs. At TBS, they receive the skills and knowledge necessary to lead Marines in combat; much like "every Marine is a rifleman", every officer is introduced to the skills necessary to lead a provisional rifle platoon. ^ Home - Commanding Officer. Trngcmd.usmc.mil. Retrieved on 2013-07-23. ^ Home - Sergeant Major. Trngcmd.usmc.mil. Retrieved on 2013-07-23. ^ "US Marine Corps Platoon Leader Course: What You Need to Know". The Balance. Retrieved 2017-10-08. ^ "Earning a Commission". U.S. Marine Corps Officer Candidate's Guide. United States Marine Corps. Archived from the original on 2012-07-14. Retrieved 2007-01-28. ^ "U.S. Marine Corps Officer Candidate's Guide". Retrieved 2007-01-27. ^ Lowe, Christian. "Leadership ability tested in frustrating 'SULE' course, April 07, 2004. Accessed April 07, 2010. ^ Lowe, Christian. "Walking the razor's edge: Those who don't quit or aren't booted keep up the fight", Marine Corps Times website, April 07, 2004. Accessed January 30, 2010. Wikimedia Commons has media related to Officer Candidates School (United States Marine Corps). This page was last edited on 4 March 2019, at 22:07 (UTC).